Toshihide Migita (1863-1925) Hideyoshi Dismounts his Horse Pursued by a Soldier of the Akechi, 1893. Oban triptych. Toshihide was a pupil of Yoshitoshi and studied western painting under Kunisawa Shinkuro - both of these influences are very evident in the drawing and composition of the piece. These dramatic set pieces by Toshihide bring ukiyo-e to a close really; they are the final and successful marrying of the traditional and the western style and with few exceptions the art of Japan would move, like their technology, in a relentlessly western movement. It is impossible not to see the hand of Yoshitoshi in this very beautiful print - especially in the pursuing Akechi warrior in the left hand panel. The subject of the print is once again the legendary samurai and statesman Hideyoshi (pictured here on the right). The history here is the events surrounding the incident at Honno-ji in 1582. Oda Nobunaga, the great general and driving force behind Japan’s unification, has been assassinated by a trusted ally - Akechi Mitsuhide. In the power struggle that ensued, Hideyoshi (Nobunaga’s natural successor) hunted down the Akechi clan and eleven days after the incident Mitsuhide was killed at the Battle of Yamazaki. These historic triptychs of Toshihide are among his best work. 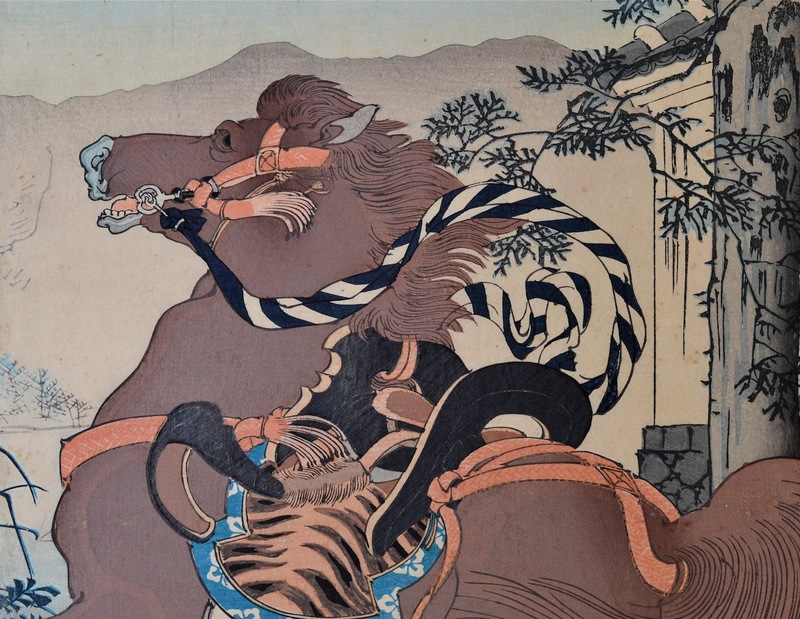 Building upon the gracefulness of Yoshitoshi’s late style, Toshihide was able to master the sometimes harsh colours of the Meiji palette and produce lyrical and brush-like pictures of great subtlety and cinematic breadth. A fine print in perfect condition with extensive bokashi shading and burnishing. The colour and impression are exceptional.